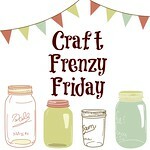 Check out my Link Party on Fridays here at Craft Dictator!! We welcome you to add your link up parties below! We are more likely to visit them if they are on our list! Also, make sure that you only add your link up parties! Thanks for coming by to see where we party!